The Hyblaean Mountains (Italian: Monti Iblei) is a mountain range in south-eastern Sicily, Italy. 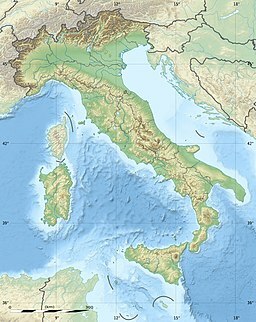 It straddles the provinces of Ragusa, Syracuse and Catania. The highest peak of the range is Monte Lauro, at 986 m.
The name derives from the Siculi king Hyblon, who gave a portion of his territory to Greek colonists to build the town of Megara Hyblaea. The range is composed of white limestone rocks, characterized by Karst topography. Originally a plateau, rivers have eroded the landscape, forming numerous deep canyons. In the coastal area sandstone is also present. In some areas, such as that of Monte Lauro (once part of a submerged volcanic complex), volcanic rocks are also present. The Hyblaean Mountains are characterized by gentle slopes, interrupted by sharp valleys. In the central area are numerous woods which are intermingled with dry stone walls of typical of south-eastern Sicily. The more populated coastal area is characterised by terraced hills with Mediterranean vegetation, rising up to a plateau cultivated by olive trees, vines, citrus fruit and almonds. Other crops include grain and maize. Main attractions of the area include the Baroque towns of Ragusa, Modica and Palazzolo Acreide, the Necropolis of Pantalica and Cava Ispica. Panorama of the Hyblaean Mountains. The range is drained by several rivers, which flow into either the Mediterranean sea or the Ionian sea. ^ "Fiume Anapo". Fiumi.com. Retrieved 2017-02-28. ^ "Fiume Irminio". Fiumi.com. Retrieved 2017-02-28. ^ "Fiume Tellaro". Fiumi.com. Retrieved 2017-02-28. ^ "Fiume Cassibile Cava Grande". Fiumi.com. Retrieved 2017-02-28. ^ "Fiume Ippari". Fiumi.com. Retrieved 2017-02-28. ^ "Torrente Modica". Fiumi.com. Retrieved 2017-02-28. ^ "Torrente Tellesimo". Fiumi.com. Retrieved 2017-02-28. Grandi Montagne - Sicilia. 2007. This page was last edited on 2 January 2018, at 20:13 (UTC).